The aforementioned quote from movie, Art School Confidential, had me laughing but remember what Freud said about jokes, there’s a smidgen of truth in them. Talk about artists swimming upstream! It’s no wonder artists struggle both individually and within a community. With the artist’s plight in mind, I couldn’t help but think of depictions of the artist’s temperament. Many adjectives describe artists; genius, edgy, quirky, eccentric, abstract, literal, narrative, conceptual, derivative, and the list goes on. Artists (including art professors and professionals) aren’t spared from stereotypes. I told you the obvious, I know. We’re all subjected to looking at the world through a Gestalt lens to help organize our experiences and knowledge and the art world certainly doesn’t elude categorization (as much as it may want or like to). Music, books, and film have all showcased different impressions of artists, art professors, and professionals. Confinement to the couch the past couple of days had me bundled up and watching movies to pass the time. Woody Allen‘s Vicky Christina Barcelona and Art School Confidential directed by Terry Zwigoff based on Daniel Clowes work provide interpretations and stereotypes of the artist’s mind. In examining others (whether through real life tales or a fictitious stories), inevitably, we examine ourselves. Who doesn’t? The instances I find myself being judgmental; often times, I either want what is not presently in my life (that which I’m seeing, reading, or listening to – the inevitable act of comparing) or I see aspects of myself I don’t particularly like. In Vicky Christina, Juan Antonio and Maria Elena are a carefree, highly sensitive, romantic, volatile, and poetic couple while Art School Confidential transforms comic book representations of art school archetypes but falls flat. Both are pretty extreme in their depictions. 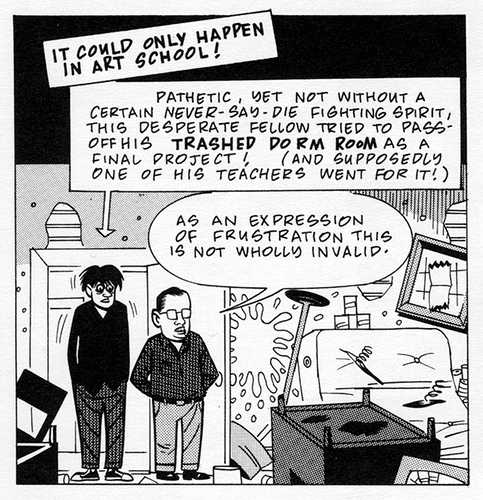 Sadly, I wish Art School Confidential wasn’t made into a film. When brought to life, the characters were just as two-dimensional (if not more) than the actual comic from which they were derived from. Unlike Daniel Clowes other graphic novel film adaptation, Ghostworld; Art School Confidential couldn’t mimic the richness and versimilitude of Enid (main character from Ghostworld). Even the stereotypes seemed over the top but I’m glad I watched it. As for Woody Allen, I hope he knows not all artists look as hot as Javier Bardem and Penelope Cruz, that drinking and smoking in bars is a ridiculously romanticized view, and artists aren’t all that tortured and polyamorous (well…maybe, in some instances, he may be right). Honestly, I loved Annie Hall way more. Artists and the art world aren’t that inaccessible and exclusive. Far from it! Then again, who wants to watch a movie filled with artists that get along and make a good living (why am I the only one raising my hand here!!). Posted in Art, Art Practice, Art Writing and Criticism, Artist's Philosophy, Artist's Studio, Film and tagged as art practice, art school, art school confidential, art stereotypes, artist temperament, postaday2011, studio art. Eloquently stated, Dorothy. I’d also recommend the movie, “Untitled,” from 2010. It’s a comedy of manners about the Art world and includes portraits of not only artists, but other players like gallerists and collectors. It holds so many truths I found it positively breathtaking. Thanks for the recommendation, Tim! I’m definitely adding “Untitled” to the list. I’ve been streaming a lot of art docs via netflix as well as borrowing from a local movie rental place in Bernal Heights (4Star). They have an amazing collection of art documentaries and movies. I STILL need to watch ‘Portrait of Jason’. Thanks again, Tim.